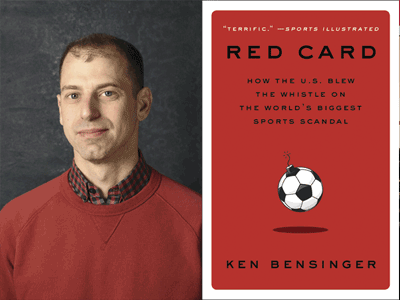 Gerald Loeb Award-winner and Pulitzer Prize finalist Ken Bensinger discusses his critically-acclaimed debut book, Red Card: How the U.S. Blew the Whistle on the World's Biggest Sports Scandal. Red Card goes beyond the headlines to bring the real story to light, accompanying the determined American prosecutors and special agents who uncovered what proved to be not only the biggest scandal in sports history, but one of the biggest international corruption cases ever. And it is far from over. Ken will be in conversation with Leslie Caldwell, the top DoJ official that oversaw the FIFA case. About Red Card: The definitive, shocking account of the FIFA scandal--the biggest international corruption case of recent years, spearheaded by US investigators, involving dozens of countries, and implicating nearly every aspect of the world's most popular sport, soccer, including its biggest event, the World Cup. About Leslie: Leslie Caldwell is a partner at Latham and Watkins in San Francisco, working on the white collar defense and investigations practice. She previously served as Assistant Attorney General heading the Department of Justice's Criminal Division, overseeing some 600 federal prosecutors nationwide. She began her career as a prosecutor in the Eastern District of New York in 1987 and later headed the DoJ's Enron Task force from 2002 to 2004 before leaving for private practice until 2014, when she returned to the Justice Department.